Public Intelligence has obtained the most recent version of the U.S. Civil-Military Strategic Framework for Afghanistan, the second revision of the document dated August 2013, detailing the U.S. government’s goals and priorities for rebuilding Afghan society. Issued by the U.S. Ambassador to Afghanistan James Cunningham and signed by the commander of U.S. forces Joseph Dunford, the framework covers U.S. priorities related to governance, the rule of law, socioeconomic development as well as the gradual transfer of authority to the Afghan government. 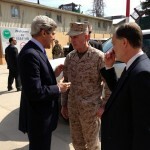 When compared with a previous version of the framework from March 2012, also obtained by Public Intelligence, the document solidifies the prospect of long-term U.S. involvement in Afghanistan, removing optimistic statements about turnover dates and self-sustaining funding estimates and replacing them with measured assessments reinforcing the notion that U.S. and international forces will be present in Afghanistan far into the next decade. The purpose of The Counterinsurgency Training Center—Afghanistan (CTC-A) “Counterinsurgent’s Guidebook” is two-fold. First, to provide a common language and framework for counterinsurgents currently engaged in Afghanistan, as well as those involved in yet-foreseen conflicts. While each insurgency is unique, the principles, processes, and tools in this Guidebook are intended to be broadly applicable. The second purpose is to provide a structured cognitive process—and supporting tools—whereby counterinsurgents can translate existing counterinsurgency doctrine and theory into practical application. The intended audience for this Guidebook is operational and tactical level U.S./NATO/Coalition counterinsurgents, military and non-military alike. A presentation from the ISAF CJIATF-Shafafiyat on “Countering Corruption and Organized Crime to Make Afghanistan Stronger for Transition and a Good Future” dated March 2012. According to FM 3-24, the population is the center of gravity for COIN operations. Afghanistan‘s population is roughly half female, half male, but in Afghanistan, the culture segregates by gender. As such, the appropriate operational response that is culturally sensitive to that segregation is to interact male to male & female to female. We want to understand 100% of the community by engaging them directly (Figure 1). By doing so, we get the insight that we need, while being respectful of the culture, yet building the fundamentally essential social contracts founded on trust and established in a cooperative environment. That social contract needs to be with the male and female population…both of whom are making decision about the future of this country, whether publicly or privately. ISAF forces are currently making decisions along all lines of operations that affect the entire population but with limited insight or perspective from the female half of the population. Where’s the Evidence Against Staff Sergeant Robert Bales? 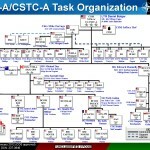 NATO Training Mission-Afghanistan (NTM-A/CSTC-A) Organizational Chart from January 17, 2012. The level of partnership with ANSF units largely depends on the individual coalition commander’s discretion whether it is a partnered unit or an advisor team. Although this discretion is important to empower leaders on the ground, the current parameters in partnering guidance are very broad which leads to varying levels of effectiveness and consistency. Standardized guidelines would provide specific tasks (e.g. develop and conduct all planning and operations from a Joint TOC) to units designated as ANSF partners. Additionally, true embedded partnership improves ANSF development, mission accomplishment and force protection. The recommendations in this paper offer uniformed standards throughout diverse allied forces, assistance during RIP/TOA, improvement in the development of the Afghan forces, and a path to effective transition. Media Operations is responsible for the Command’s media relations activities, including identifying media to engage with to disseminate information, responding to queries, arranging interviews, and advising senior leaders and IJC members on media issues. Media Operations works with local and international media. The staff also manages the IJC media accreditation and embed programs, and works closely with Regional Commands and NATO Training Mission-Afghanistan (NTM-A) Public Affairs staffs. IJC Media Operations distributes, under its letter head, releases from special operations units. International Security Assistance Force (ISAF) IED Detector Dogs Standard Operating Procedures 3402 from May 2011.
International Security Assistance Force (ISAF) Standard Operating Procedures for Detention of Non-ISAF Personnel from August 2006. U.S. Army Afghanistan Regional Command East Stability Operations Overview from May 2011. The mission of CJTF Phoenix is to train and mentor the Afghan National Security Forces (ANSF) to conduct independent, self-sustained Counter Insurgency (COIN) and Security Operations in order to defeat terrorism and provide a secure, stable environment within the borders of Afghanistan. The ANSF is primarily composed of the Afghan National Army (ANA), Afghan Uniformed Police (AUP), Afghan National Police (ANP), Afghan Border Patrol (ABP) and Afghan National Civil Order Police (ANCOP). The Afghanistan Peace and Reintegration Programme (APRP) is active. It provides for both reintegration (where fighters leave the fight and peacefully rejoin their communities) and reconciliation (where entire insurgent groups reach a settlement with GIRoA that ends hostilities). Reintegration is the focus of this guide. 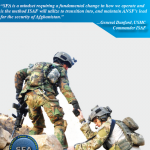 Information is presented on the APRP, its place in the COIN Campaign and ISAF‟s role. It provides those in ISAF with what they need to work with community leaders and GIRoA and ANSF partners to build their understanding of the Programme and its opportunities. It is an Afghan Programme and ISAF‟s role is to assist and encourage GIRoA to implement it fully. (U//FOUO) BLUF: The People of FAQIR KHIEL and AFGHANYA villages are not allowing the Taliban to have a presence in their villages and have even used force to run a Taliban commander and his group out. (U//FOUO) ATMOSPHERIC VALUE: Neutral; The Taliban has suffered heavy losses, including several commanders at the hands of Hezb-e-Islami. These losses have caused them to flee the UZBIN areas of the TAGAB District, KAPISA Province. (U/ /FOUO) BLUF: If ISAF leaves there will be civil war, even AAF groups are fighting among each other. But the ANA needs assistance if they are going to defend Afghanistan. But the Americans give support to Pakistan even though they support the Taliban and AI Qaeda.